When an innovator is struck with a new idea for a technology, his or her first thought isn’t necessarily “How can this be used for a humanitarian, development, or peace-building cause?” Rather, it is more often “How can I sell millions of copies of this in the Apple App Store?” or “How soon will I be able to sell this to a venture capitalist and use the money to buy my I Am Rich app". In early 2011 TechChange organized a training with FrontlineSMS that not only taught people how to use the software, but forced them to confront the issue of priorities. Against our tendency to think of ways to use the technology to benefit ourselves, we designed our own projects that used FrontlineSMS to enable social change. There was a spark of awareness that lying dormant in our creativity and innovative thinking is the capacity to use technology in a more responsible way. Led by FrontlineSMS gurus Sean McDonald and Laura Walker Hudson, we were introduced to FrontlineSMS as a powerful and simple technology, which uses a computer, a mobile phone, and text messaging to easily communicate with groups of people. The potential uses for this technology are boundless, as evidenced by FrontlineSMS’s sector-specific projects that reach “specific fields such as finance, education, law, and media”. While one organization can use it as mobile healthcare for expectant mothers, another can use it to stabilize markets by providing local fishermen with real time price information. We were presented with numerous case studies all validating the fact that open source technology can help bridge the gap between vulnerable populations and the information and tools they need. We were then split into groups, given a modem connected to FrontlineSMS, and asked to think of a real world problem to confront. It’s interesting to think that every day we sit in front of a computer or play with our iPhones and all of these technologies have the possibility of answering some sort of global need but it very often doesn’t even cross our minds. It’s not an automatic motive. But at the FrontlineSMS training, we were forced to think of others before self, since that was the assignment. Thus, we trained a room of FrontlineSMS ninjas – compassionate, philanthropic ninjas. They came up with strategies to connect LGBT populations to service providers and to improve parent-teacher relations, and in the process learned about the technical and more importantly contextual issues that must be resolved to bring about real change. TechChange is planning to host more tech trainings throughout the year. We want to get creative people armed with emerging technologies and collaborating on the hardest problems facing our generation. And of course, one of the best parts of open source is the social and community aspect – there was a very nerdy happy hour afterwards which I wasn’t legally allowed to attend but I hear it gets pretty wild. The above has been re-posted from TechChange blog with permission. Post by Mariel Bartolome, Technical Coordinator at TechChange and a computer science major at the University of Maryland College Park. “TJ said his body feels like it's on fire! Hurry!” Shouts like this one echoed through the halls of George Mason University as ten School for Conflict Analysis and Resolution (S-CAR) students participated in a simulated malaria outbreak as part of their Technology for Peacebuilding course facilitated by TechChange. The goal of the simulation was to provide students hands-on experience using FrontlineSMS software. TechChange staff built the simulation around an existing case study of a FrontlineSMS implementation currently underway to track the spread of malaria in Cambodia. The staff sought to mimic many challenges present in the field in order to get students to think critically about both the great advantages and limitations of using technology like FrontlineSMS in crisis response. Students were given a basic overview of malaria symptoms and risk factors and then the class was broken into three groups. Each group was equipped with a computer running FrontlineSMS using a GSM modem, which allowed them to send and receive text messages. 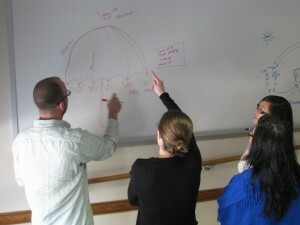 Groups were responsible for engaging three sick residents, performing an assessment of each resident's situation, and deciding on an overall treatment plan specifying which patients should receive medication (and in what order) based on information the group was able to collect from those residents or a public health worker in the field. The three residents were spread out on a different floor from the groups and were instructed to convey varying degrees of sickness and proximity to water (a known risk-factor for malaria transmission) to the groups. All residents in the simulation had access to cell phones. Resident One – High risk – Resident One lived near a water source, complained of a fever and a headache, but was unwilling to provide information to the health workers. He was only marginally literate, but would take medicine if it was administered to him directly. Resident Two – Medium to high risk - Resident Two lived near a water source, complained of a fever, but not of a headache. He was willing to share information with the health workers, and would take medicine only if the health worker observed him taking it. Resident Three – Low risk – Resident Three did not live near a water source, did not have a fever or a headache, but had severe gastrointestinal (GI) pain. He was very communicative and would take any medicine administered to him. Under ideal circumstances groups would administer medication to Resident One and Two, but not Resident Three. This variation was built into the simulation to challenge the groups to think critically about their responses rather than simply medicating as many residents as possible. This is especially important for diseases like Malaria that have drug-resistant strains, and in situations where the treatment itself can be harmful or where medicine might be in short supply. Text messaged reports from the field began rolling in as groups developed surveys and strategies to determine the health status of each resident. Groups also communicated with their public health worker to assess their progress and alert them to any information they received from the residents directly. Groups quickly recognized their need for a set of guidelines and best practices for their use of FrontlineSMS. One group decided to focus on preventive education and sent welcome texts to the residents encouraging them to abide by good health and sanitation practices. Another group sought to streamline their communications by introducing a numeric scale for fever and pain that shortened the text messages and made them easier to process. In the end, Resident One received medication from only one group, meaning two groups’ approaches were unable to treat the highest risk patient effectively. All three groups successfully treated Resident Two, but also decided to treat Resident Three, the lowest-risk resident. Although none of the groups reached the optimal solution for the simulation, they all gained valuable experience with FrontlineSMS and the complexities of program design. Simulations are great platforms for learning tech – After the simulation, students expressed that they greatly enjoyed the activity because it was a practical, hands-on, and interactive way to learn about FrontlineSMS. They all appreciated learning how to use the software in a fun engaging and intense manner such as this. Technology does not obviate need for good program design – All of the groups were able to leverage FrontlineSMS to enhance their programs, rather than relying too heavily on the technology alone. Students did a great job following up with residents after sending text messages and ensuring that FrontlineSMS was used to streamline communications, but not replace the human element of their program. Mobiles for International Development: New Platforms for Public Health, Finance and Education (Oct 16-Nov 4th).